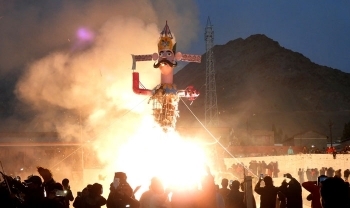 Dussehra was celebrated with great religious fervor by burning the effigies of Ravana, his brother Kumbkaran and son Megnath on October 19 at Pologround in Leh. The festival was organised by the Hindu Trust (Maha Sabha) wherein Avny Lavasa, DC Leh was the chief guest. District officers, Political leaders, and Members of Hindu Maha Sabha Trust were present during the occasion.